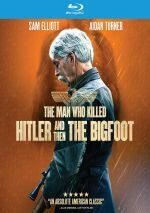 Fresh off his Oscar-nominated supporting role in 2018’s A Star Is Born, Sam Elliott takes the lead in 2018’s The Man Who Killed Hitler and Then the Bigfoot. Back in World War II, Calvin Barr (Aidan Turner) used to work as a master assassin. Despite the public belief that Adolf Hitler committed suicide, it turns out that Calvin killed the infamous Nazi. Disillusioned by his experiences, eventually Calvin became bitter and reclusive. Decades later, the Bigfoot (Mark Steger) roams the Canadian wilderness and carries a disease that could turn into a plague if exposed to humans. The authorities coax an elderly Calvin (Elliott) out of retirement to save mankind one more time. When it comes to quirky movie titles, The Man Who Killed Hitler and Then the Bigfoot stands high on that particular hill. With a name like that, audiences likely viewed it as a drive-in grade exploitation flick. Which it occasionally threatens to become, such as when old Calvin takes down some punks. Every once in a while, the movie feels like it wants to embrace the inherently Tarantino bent the title implies. However, most of Killed offers a more somber character piece, one that also follows a less linear path than my synopsis indicates. Rather than progress chronologically, the movie leaps back and forth from WWII to old Calvin in 1987. This makes some sense in terms of thematic decisions, as the construction allows the viewer to better contrast Calvin’s past with his present. However, the two eras mesh less well than I’d like, and the leaps from the 1940s to the 1980s don’t flow especially smoothly. Honestly, nothing about the movie progresses in a particularly logical or concise manner. Killed often feels like a nearly random collection of scenes cobbled together with some form of thematic concept in mind, but those notions never become clear. Killed tends toward the “slow and dull” side of the street, and its construction remains so semi-random that nothing here offers impact. The movie almost indulges the violent promise of its title when Calvin finally goes after the Bigfoot about two-thirds of the way into the proceedings, but even those moments lack momentum. On the surface, it might sound like my main complaint about Killed stems from the fact the movie’s content doesn’t match with its drive-in title, but that’s not accurate. I think the title is a mistake for a movie that wants to offer a serious character drama, but the disconnect between it and the actual story doesn’t bother me. The sluggish pace, awkward construction and lack of character depth do trouble me, though. Killed fancies itself as a reflection on life, love and loss, but instead, it ends up as a meandering snoozer. 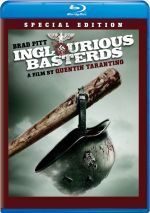 The Man Who Killed Hitler and Then the Bigfoot appears in an aspect ratio of approximately 2.40:1 on this Blu-ray Disc. This was a largely positive presentation. Overall sharpness seemed good, though inconsistencies occurred, mainly during low-light shots. Those could be a little soft, and since the film came with many of these dim interiors, the movie showed mild drops in delineation. Jagged edges and moiré effects didn’t mar the presentation, and I saw no edge haloes. Print flaws also failed to appear. In terms of palette, Man went with a heavily teal and orange orientation. Splashes of other hues appeared on occasion, but they remained in the minority. Within stylistic choices, the hues seemed well-depicted. Blacks were dark and dense, but shadows seemed a little inconsistent. As noted, low-light shots could be a bit on the dense side. Otherwise, this became a well-rendered affair. As for the DTS-HD MA 5.1 audio, it offered a fairly involving affair, though it didn’t seem as active as the movie’s title might imply. While Killed came with occasional action flourishes, it usually emphasized character beats. Along with good stereo music, the soundfield was able to open things up in a satisfying manner that embellished the story. A few violent pieces added the most pizzazz. The mix didn’t dazzle, but it worked fine. A few extras show up, and we begin with an audio commentary from writer/director Robert D. Krzykowski. He presents a running, screen-specific discussion of story/characters, cast and performances, sets and locations, music, editing, stunts, effects, audio and connected domains. Krzykowski offers a pretty solid examination of his film. He covers an appropriate array of topics and makes this a thoughtful, engaging track. With The Making of The Man Who Killed Hitler And Then the Bigfoot, we get a 39-minute, 14-second program. It includes notes from Krzykowski, executive producers Douglas Trumbull and John Sayles, producers Lucky McKee and Patrick Ewald, visual effects producer Rocco Gioffre, editor Zach Passero, and actors Ron Livingston, Sam Elliott, Larry Miller, Rizwan Manji, Mark Steger, and Caitlin FitzGerald. “Making” looks at the project’s roots and development, story/characters, cast and performances, and effects. Expect a pretty nice overview of the production in this informative show. Music comes to the fore via A Conversation with Composer Joe Kraemer. In this six-minute, 23-second piece, Kraemer talks about his collaboration with Krzykowski, influences, and aspects of his score. Kraemer brings us a useful view of his work. A short film called Elsie Hooper runs five minutes, 45 seconds. A 2016 effort that represented Krzykowski’s sole credit as writer/director prior to Killer, Hooper offers an odd mix of action and noir affair. It’s semi-interesting but a bit of a mess – and also ends with a teaser for a second chapter that never came. Six Deleted Scenes fill a total of eight minutes, 52 seconds. Most are pretty sure, and the longest gives us an amiable chat between young Calvin and Maxine. None of them seem especially important. We also find a Concept Art Gallery. It offers 19 images and gives us a good look at the original ideas. The disc opens with ads for Bone Tomahawk, The Osiris Child and The Standoff At Sparrow Creek. No trailer for Killed appears here. Despite its wacky title, The Man Who Killed Hitler and Then the Bigfoot delivers a fairly somber character drama. Unfortunately, it gives us a pretty dull tale that never expands its roles or concepts in a satisfying manner. The Blu-ray provides generally positive picture and audio as well as a useful set of supplements. I wanted to like Killed but the end result left me bored.